The Kobo Touch just got a lot more interesting. It turns out adding new fonts to it is as easy as finding hippies at a Grateful Dead concert, and takes all of about 2 seconds to accomplish. 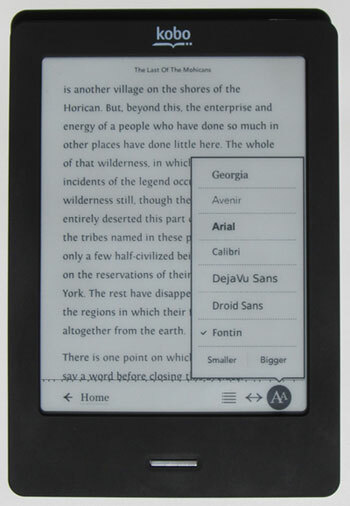 By default the Kobo Touch has seven font types, Georgia, Avenir, Amasis, Delima, Felbridge, Gill Sans, and Rockwell. You can also easily add a multitude of other TTF and OFT fonts by following a couple of quick steps. Plug your Kobo into your computer with the USB cable and tap connect on the Kobo. Open the Kobo Reader drive if it doesn’t automatically open (mine shows up as KOBOeReader). Create a new folder on the root level of the Kobo Touch and name it fonts. The root is the top level folder with the existing .kobo and .adobe-digital-editions folders. Add your choice of fonts to the fonts folder, eject the Kobo, and that’s it. It’s good to go. When you tap the Aa in a Kobo book, the new fonts will show up on the list. You can find fonts on your computer by typing “font” into your computer’s search bar. Or you can find some new fonts online. Google web fonts is a good place to start. Adding the italic and bold versions of the font to the folder is a good idea since most books use font styling. If you want the font to be bold or italic instead of normal, just add the bold or italic version of the font to the folder and not the regular. Thanks for the tips on adding fonts. Would you know if Kobo Touch supports fonts in other languages? I’m looking for Malayalam language support in particular.